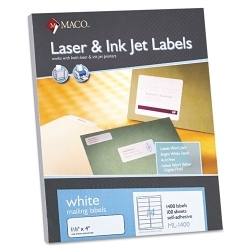 Maco 1 1/3 X 4 Laser Label 1400/BX (ML-1400) : Disk-O-Tape, Inc.
White address labels for laser & inkjet printers with permanent adhesive. Label size: 1-1/3" X 4"
Sheet size: 8-1/2" X 11"
Copyright 2019 Disk-O-Tape, Inc. All Rights Reserved. All brands and product names are trademarks or registered trademarks of their respective companies. 23775 Mercantile Rd., Cleveland, OH 44122-5917 U.S.A.